Photos of the suspect were posted to the Cherry Hill Police Department Facebook page on Monday morning. 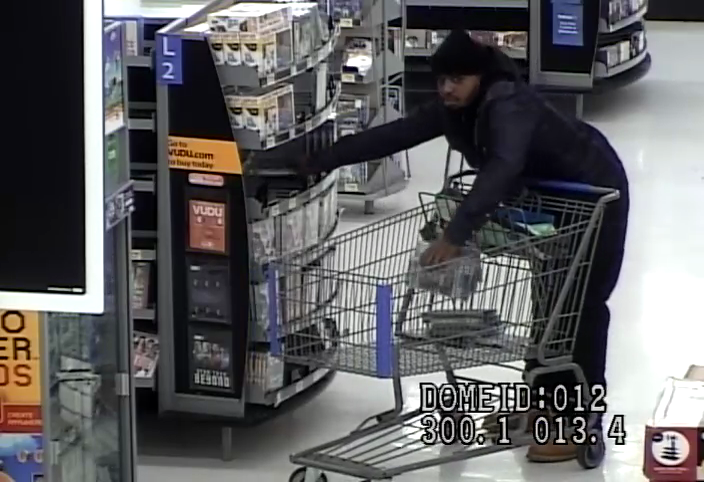 Cherry Hill Police are looking for help in identifying a man who committed a theft at the Walmart in Cherry Hill last month. Police released two surveillance photos on its Facebook page Monday of a man who is thought to have committed a theft at the Walmart on Route 38 in Cherry Hill on Dec. 8. The man can be seen leaning over a cart and placing items into the cart. The man appears to be wearing a black hat, dark-colored jacket and boots. Anyone with information on the suspect can contact Det. Bryant of the Cherry Hill Police Department at (856) 432–8832 or sbryant@cherryhillpolice.com. Information can also be provided anonymously at tips@cherryhillpolice.com.